Callum Hudson-Odoi make his first Premier League start as Chelsea dismantle Brighton 3-0 at Stamford Bridge. Chelsea took the lead in the first half through Olivier Giroud. The Blues quickly doubled their lead through a piece of excellence from Eden Hazard who curled the ball into the top corner. Ruben Loftus-Cheek added his name on the goal tally which put Chelsea three ahead. 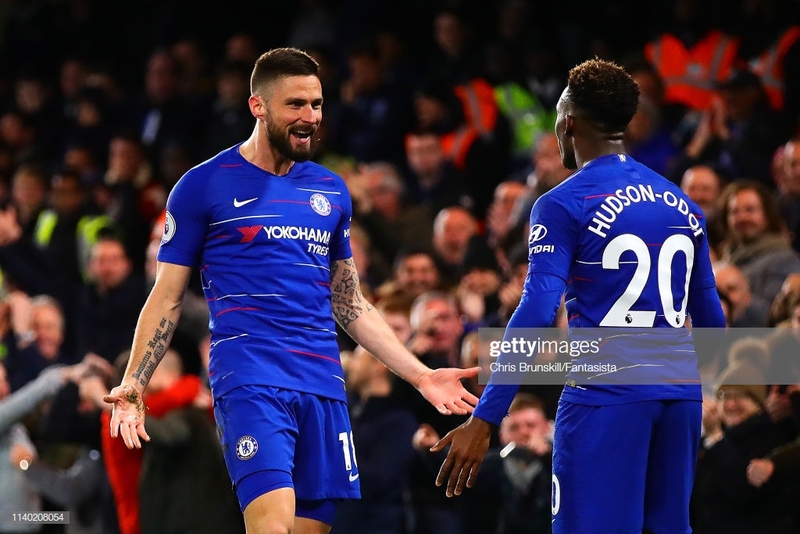 Maurizio Sarri made seven changes to the side that started in the Blues’ dramatic 2-1 win over Cardiff and provided prospect Callum Hudson-Odoi with his first Premier League start. Chelsea’s number ten, Hazard, returned to the starting eleven along with Giroud, Loftus-Cheek, N’Golo Kante, Emerson and Andreas Christensen. A win for Chelsea has sent them into fifth position ahead of Manchester United. The away side made four changes from their previous result which ended in a 1-0 loss to Southampton. A loss for Chris Hughton’s side has left Brighton sitting 15th and winless in two. Chelsea dominated the first half and held the Seagulls to just one shot on goal. Upon return to the starting eleven Hazard was central to the home side’s thrust. The Belgian played an intelligent pass to the on-running Emerson. The Italian’s curling cross failed to find it’s target. The Blues ensured their dominance paid off when Giroud put the home side in front. Hughton’s team were pinned back and after a succession of passes around the edge of the box Hudson-Odoi darted past substitute Anthony Knockaert. The Chelsea starlet then drilled a low cross across the face of goal which found Giroud who guided the ball beyond Mat Ryan. Sarri’s side launched out of the blocks in the second half. Hazard doubled Chelsea’s lead with a delicious curling shot into the top corner. Chelsea’s number ten sat down a lunging Lewis Dunk, cut inside onto his right foot and then curled his shot past a helpless Ryan. Soon after Loftus-Cheek added his name to the goal tally and put the home side three ahead. The England international received the ball on the edge of the box, turned and guided his shot past Ryan. A carbon copy of Hazard’s goal. Chelsea’s number 20 was handed his first Premier League start and posed a threat throughout. Hudson-Odoi provided the assist for Chelsea’s first goal of the game after the winger dashed beyond the trailing Knockaert. He continued to vary his game with runs in-behind, coming short and off the ball runs. A goal and assist upon return for Loftus-Cheek. The midfielder showcased his quality with a delightful finish as well as neat link up play with Hazard. The 23-year-old has suffered minor injury set backs this season but has finally worked back into full fitness. Consistency will be key for Loftus-Cheek as games against Liverpool and United are fast approaching.